Full kitchen & grills available for guests' use. 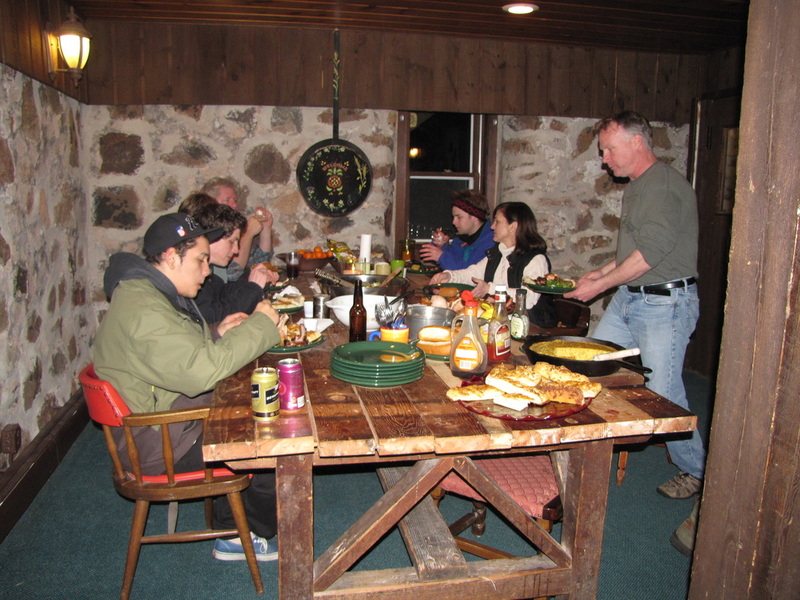 Group dining at large farmhouse table and in rustic bar area. Plenty of additional seating inside and out. And plenty of restaurants and catering in the immediate area. Complimentary Saturday Breakfast with weekend stay for individuals and small groups. For larger groups, we just turn the kitchen over to you to organize your group meals. We have award winning local chefs/caterers and we'll help coordinate group catering if desired. Dining in the area is also available, Big Powderhorn offers two restaurants, the Black River Valley Pub is across the street. Live music and/or dj on weekends at Big Powderhorn. 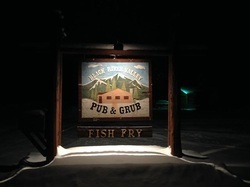 Black River Valley Pub - just a couple blocks away, across Black River Road - Entertainment on weekends Dec 27 - Mar 1. The Pub is our go to for great food, full bar and entertainment. Dine in or take out. Check Kimball Inn on FB for dinner specials. Same owners as Burgers Bar in Gile, WI - Great food, great service. Brunch on Sundays and great meals. Silver Street, Hurley, WI. Steakhouse and dining. Great prime rib Saturday nights. Steakhouse and Sports Bar with big screens and dinner. Don and GG’s restaurant & bar offers casual dining, juicy burgers, great steaks, sandwiches and great salads. With views of the Gogebic Country Club, serving Friday Fish Fry, Pizzas, Italian and American cuisine. Just off Hwy 2 in Ironwood @ Gogebic Country Club across from Walmart. Award-winning local pizza, famous for its homemade sauce and pizza dough made daily from scratch. Home of the 2' pizza that's hard to get through the front door. Tacconelli's Bessemer delivers to the Lodge. Highway 2 in Wakefield. Good old fashioned cooking with daily specials. Small town diner atmosphere. Breakfast, Lunch, Dinner. Breakwater is a full service American-style family restaurant on Hwy 2 in Ironwood. Contrast Coffee - Aurora Street, downtown Ironwood with Bakery in the back. 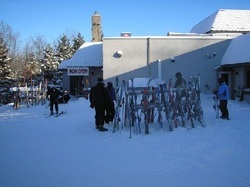 GEAR - Big Powderhorn offers a ski shop operated by Hobby Wheel. Ableman's in Bessemer great selection of outdoor & work gear, name brands and boots & shoes - great store! ARTS - Downtown Arts Place offers gallery exhibits and classes and artist studios open for business, shop for handmade goods and visit artist lofts. Z Gallery on Hwy 2 has handmade gifts and art by local artists, the Leather & Gift shop in Bessemer on Hwy 2 had super cute, handmade gifts and crafts. Wine and Paint classes, glass blowing and other arts classes/activities available by request. THEATER - Historic Ironwood Theater with national touring shows is a beautifully renovated historic theater. Theatre North, in Ironwood also offers touring shows and community theater. SHOPPING - Ben Franklin in downtown Ironwood offers a very large selection of local nick-nacks, clothing, home decor and general gifts. Antiquing in downtown Ironwood is a great past time of visitors to the area. With our area rich in mining and logging, a walk through the shops in town give you a sense of the old days.